A dynamic portrait of our Milky Way galaxy shows a frenzy of gas, charged particles and dust. 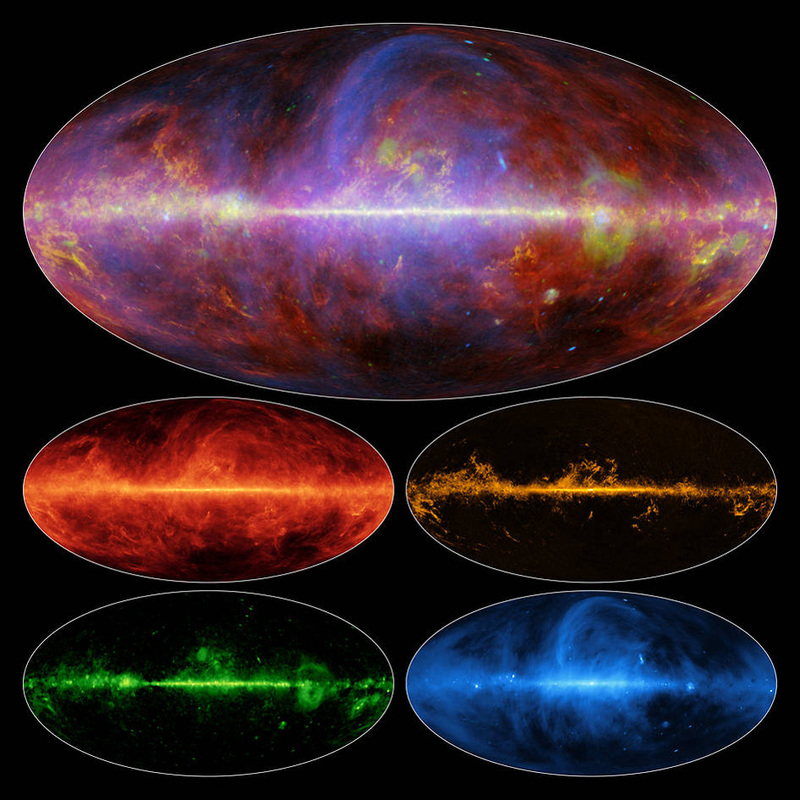 Multi-wavelength surveys allow astronomers to map the sky in different bands, providing a different view of the Universe. Surveys are often focused on answering particular astrophysical questions, but are becoming a vital tool for the community, which can be used for years to come. Mapping the sky at different frequencies/wavelengths, in different emission/absorption bands, and in polarization, allows astronomers to get a complete picture of the Universe. JBCA is involved in a number of large surveys, covering the entire electromagnetic spectrum. We are involved in a number of sky surveys, which allow us to study a range of astrophysical phenomena across a wide range of wavelengths. A preliminary C-BASS map showing polarised emission at 5GHz from the northern survey. C-BASS North in the snow. The C-Band All Sky Survey (C-BASS) is an experiment that is mapping the whole sky at a frequency of 5GHz in both temperature and polarization. Its aim is to enable the accurate subtraction of foreground synchrotron emission from our Galaxy in both intensity and polarization from maps of the Cosmic Microwave Background (CMB). C-BASS is observing the universe using two telescopes, one at Owens Valley Radio Observatory, California, and the other at the Square Kilometre Array in the Karoo desert, South Africa. C-BASS data will have a wide range of applications including the study of astrophysical emission mechanism, Galactic structure, Galactic magnetic field, and component separation for CMB experiments. C-BASS: C-Band All Sky Survey - The C-BASS project website. C-Band All Sky Survey - on Wikipedia. The image above shows the integrated RRL intensity map covering a large area of the Galactic plane. Manchester has pioneered observations of radio recombination lines (RRLs) since the 1960s. RRLs are the emission lines from atoms when electrons in ionized gas fall from a high-to-law quantum number. They are a probe of the warm ionized gas in the interstellar medium and can be used to probe the density, temperature, and ionization state of interstellar gas. Since they emit at radio wavelengths, the emission is not absorbed as it travels through the Galaxy, providing an unimpeded view. JBCA researchers have re-analysed the data from the HI-Parkes-All-Sky-Survey (HIPASS) to make the first contiguous large-area RRL survey of the Galaxy. The final Galactic plane survey, covering longitudes 248-0-52 degrees is now available online. The data reduction and analysis is described in Alves et al. (2015, MNRAS, 450, 2025). The JBCA SSG group is involved with many large international survey projects using SKA pathfinder and precursor telescopes, including e-MERLIN, VLA, EVN, MeerKAT, ASKAP, LOFAR and APERFIF. A number of JBCA staff are also involved in the scientific development of the SKA itself and are leading members in the SKA Science working groups. JBCA researchers are also involved in number of current and future key survey projects using SKA Pathfinders and precursors including those using MeerKAT, ASKAP, VLA, EVN, APERTIF and LOFAR. 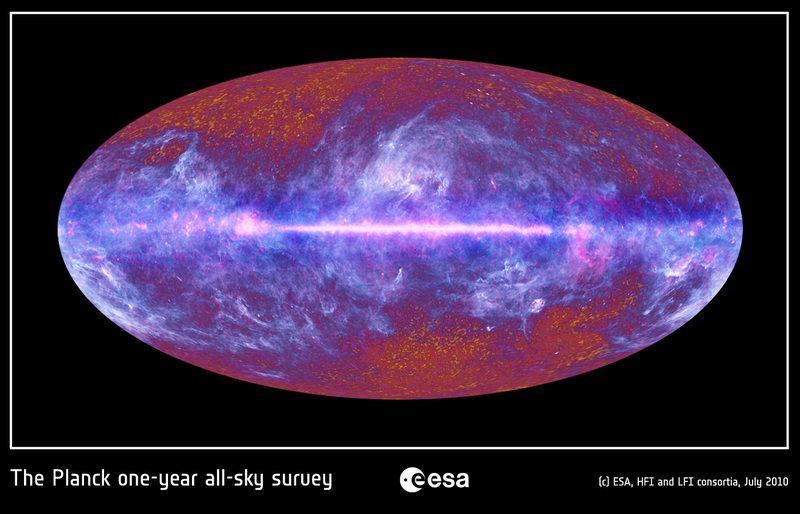 The first Planck all-sky map, showing diffuse Galactic emission at low (red) and high (blue) frequencies, as well as the CMB at high and low latitudes. The Planck satellite was a project to map the cosmic microwave background anisotropies as fully and accurately as possible. It was launched by the European Space Agency in 2009, and surveyed the entire sky for 4 years from an orbit about the L2 Lagrangian point in the Earth-Sun system, 1.5 million miles from Earth, before being switched off in 2013. Planck made very sensitive measurements at nine different frequencies at 30-857 GHz, and polarisation at seven frequencies between 30-353 GHz, using two instruments, the High and Low Frequency Instruments (HFI and LFI). Scientists and engineers at Jodrell Bank designed and built radio receivers at the heart of the LFI. These were the most sensitive receivers ever built to work at these frequencies. The cosmological parameter analysis using number counts of galaxy clusters through the Sunyaev-Zeldovich effect. The Cosmic Microwave Background as seen by the Planck satellite. Copyright: ESA and the Planck Collaboration. At the start of time, our Universe consisted of a single point of matter/energy as a result of the Big Bang. This expanded over the next 380,000 years, turning into into a dense, hot, fog of matter and light. Then the fog lifted - the photons were unbound from the atoms, and light streamed free, forming the cosmic microwave background (CMB). Over time, this cooled to a temperature today of just 2.7255K - the coldest natural temperature in the universe. The existence of the CMB was predicted as early as 1948, but it took until 1965 before it was accidentally discovered by Penzias and Wilson when they were measuring the system temperature of their telecommunications horn antenna. This famously led to them receiving a Nobel Prize for their discovery of the CMB. The power spectrum of the CMB as seen by the Planck satellite. Jodrell Bank has played a leading role in studying the CMB since the 1970s. The Tenerife Experiments in the late 1980s and early 1990s provided upper limits on the CMB anisotropies that were comparable to satellite missions at the time. The Very Small Array (VSA) provided the best measurements of the second and third peak of the CMB that were available at the start of this millennium. Jodrell Bank constructed the 30 and 44GHz low noise amplifiers for the Planck satellite, which provided the best observations of the CMB in 2013-15. JBCA continues to study the CMB using the successor satellites to Planck (LiteBird and/or CORE++/PRISM), as well as ground-based telescopes such as POLARBEAR. Large surveys, covering a wide range of frequencies/wavelengths, are an important part of our research. To get a complete picture of the Universe, it must be mapped over a wide range of wavelengths and emission/absorption lines. JBCA is involved in a number of surveys. Planck's view of the Universe. The first full-sky image from Europe's Planck telescope. M16, the Eagle Nebula from the Hubble image of the Pillars of Creation through to the latest multi-wavelength composite.